Our sugar scrub is a wonderfully refreshing scrub that exfoliates and moisturizes the skin. It is recommended for use after rinsing off the soap from your bath or shower. Raw sugar, ground oats, lavender flower buds, apricot kernel meal, and kelp powder are used in this scrub to exfoliate and nourish the skin. Shea butter and Jojoba and grapeseed oils soften and hydrate, and pure essential oils are blended for a pleasing scent. (scent will vary depending on my mood when I’m making this up) A preservative is added to this product to inhibit bacterial growth and a thickener is added to provide the proper texture. Best if stored in a cool, dark place but the shower works just fine. Our sugar scrub is available in 4 ounce and 8 ounce plastic jars. NOTE: Average use will consume approximately 3/4 ounce of scrub per shower/bath. 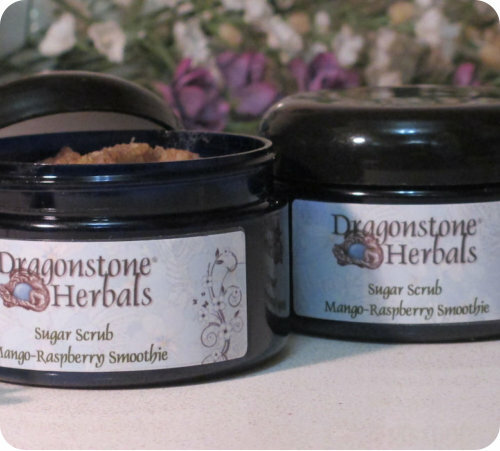 Available scents: Mango-Raspberry Smoothie, Sandalwood, Vanilla & Cinnamon, and Tangerine, Lime & Frankincense Warnings/Precautions: For external use only, do not ingest. Do not use if allergic to any of the ingredients. Do not use on broken or irritated skin. Discontinue use if irritation or redness occurs.